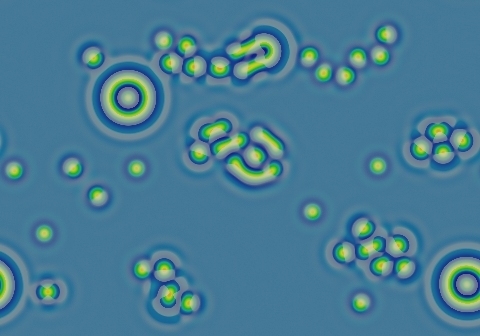 These images and movie demonstrate the behavior of the Gray-Scott reaction-diffusion system with σ=Du/Dv=2 and parameters F=0.0620, k=0.0610. 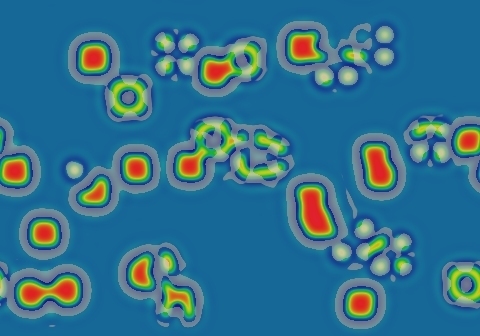 All starting patterns quickly develop into a field of blue with negative solitons (which quickly evolve into true negatons) and negative worms. Sole negatons are possible although chains and hexagonal clumps account for most of the population. 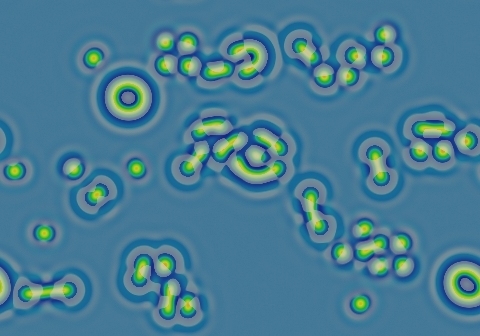 Unlike their positive counterparts, the negative solitons do not yield their position; instead, the surrounding loop connects with whatever was approaching it. Worms grow slowly, clearing out the space by pushing their surrounding negative bend ahead of them; these will follow the boundaries of the bullseye patterns to form multiple concentric rings. The symmetrical "bullseye" type pattern seen here is also fairly common. As seen here, it grows very slowly into an elongated double loop; when given enough time and space it lengthens indefinitely. 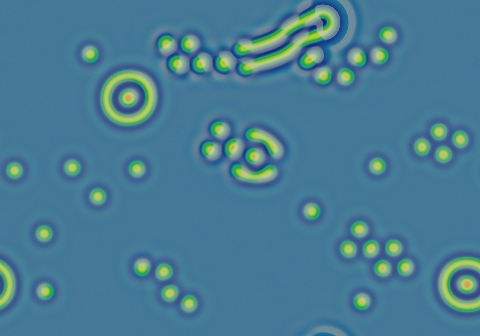 There are many stable patterns (including static, rotating, and continuously moving) at the nearby parameters F=0.0620, k=0.0609. Bends occasionally bud off new worms. 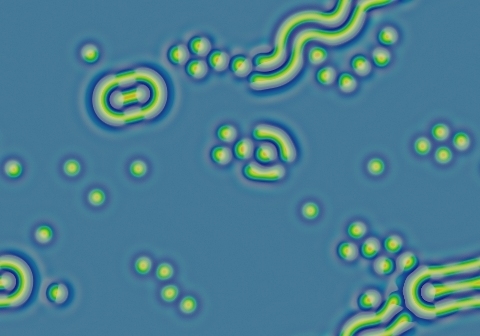 Over the course of 500,000 tu or longer, the space will become filled with the loops and worms, resulting in a fingerprint-like pattern with negative solitons intact.